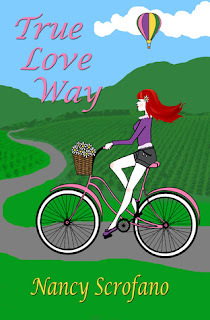 Nancy Scrofano's debut chick-lit novel, True Love Way, is amazing! Marlo Spencer will lighten up even the darkest scenes of the novel with her love for retro this and retro that. She's such a trusting and open character that readers will fall in love with her and root for her happiness at each turn. Don't expect True Love Way to be just a cute read. Despite Marlo's upbeat, optimistic voice and the humorous interludes with her best friend Nik, the story is tinted with dark secrets and emotional breakdowns. Scrofano's plot reveals itself to be realistic, twisted, engaging, and suspenseful. Some events can be seen coming from a mile away, while others will come as big surprises. Throughout all the drama, Scrofano still gets an emotional rise out of readers. The connection between the reader and Marlo will be so strong that her life becomes the life of the reader. True Love Way is the story that forces you to put yourself in the shoes of each character because of the real-life situations and relationships and outcomes. Fortunately, Scrofano doesn't only focus on the negative. Betrayal, loyalty, forgiveness, and romance blend elegantly for the perfect balance in this light drama. When Marlo's reunion with her old boyfriend takes turns for the worse there's always something, or someone, to lift her spirits and give her hope. True Love Way is an all-around wonderful read; entertaining with a side of humor. It's a debut you don't want to miss! Marlo Spencer is the main character in my novel, True Love Way, and she loves everything retro. She’s someone who thinks she should have been born in another decade, probably the forties or fifties. Marlo is an old soul, so she’s very enthusiastic about the past. Particularly, she loves old TV shows and films and oldies music. Her clothes are vintage, and if she buys anything new, it would come from a place like ModCloth.com. Marlo is definitely an individual and not afraid to be passionate about stuff that other people may not understand. She feels an affinity in her heart for bygone eras and refuses to let go of the nostalgia. My own love for classic TV and films and vintage memorabilia inspired me to create Marlo. Her interests are intensified versions of my own. I wanted to portray someone who believes that it’s okay to be different and it’s okay to love what you love, regardless of what anyone else thinks. People can be afraid to show who they truly are because they worry that they won’t be accepted by others, but Marlo doesn’t hide who she is from anyone. That’s what her friends and family love about her. My favorite show is I Love Lucy. I grew up watching it, and I think I got my sense of humor from Lucy. I’ve studied her comedy from watching the episodes over and over, and when I was a kid, I always tried to mimic her. My admiration for her runs deep, and when I watch her shows, I feel like she’s a kindred spirit. It’s like I should have been there and like that time period is where I belong. That’s how Marlo feels, and sometimes, feeling out of place comes along with that. There’s a spark within me that I can’t exactly define when I explore antiques and watch classics, though I’ve tried my best to convey my own emotions through Marlo. I’m someone who stays up late watching Time Life infomercials, even if I’ve seen them before, just to see the oldies again. I’m someone who often says stuff like, “They don’t make _____(shows, films, music, clothes, etc.) like that anymore.” I have a rotary phone on my desk. I watch The Sound of Music at least once every year. I get an I Love Lucy calendar every year. I have yet to encounter anyone who can match my knowledge when playing the I Love Lucy trivia board game. And I always sleep better if I watch an episode of Full House before I go to bed. Marlo and I are a lot alike, but we’re different too. Her story is completely fictional. None of what she goes through in True Love Way happened to me. We share similar personality traits and interests, but our stories are not the same. Marlo is quirky and sincere, and she has some growing up to do without sacrificing who she is. I think you’ll enjoy going along with her on her journey. Nancy Scrofano is the author of True Love Way. She is a freelance writer, and she is the founder and managing editor of The Chick Lit Bee, a book blog that promotes and celebrates women’s fiction. Nancy is at work on her next novel. For more information, please visit http://www.nancyscrofano.com. Now, here's your chance to win your own e-book copy of True Love Way! I Love Lucy is a classic and it never gets old! Like the trailer, also the story.